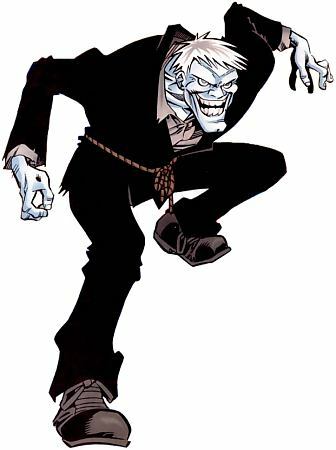 Enhanced Abilities: Solomon Grundy has superhuman strength and endurance. His strength has varied through the years and at one point not even Superman could restrain him. Body Armour: Solomon Grundy is virtually indestructible thanks to the elemental energy that imbues his form with pseudo-life. He is nearly invulnerable to physical and energy attacks and he is not affected by fire or cold. Life Support: Solomon Grundy does not need to eat, sleep or breath. Immortality: It’s possible that Solomon Grundy is immortal due to the fact that when he is destroyed he always returns to life sooner or later. In 1894, the wealthy Cyrus Gold was attacked by a man named Jem, who wanted Gold's money. Jem's girlfriend Rachel Rykel, was a prostitute Gold had once bought services from, and the two had tried to blackmail Gold about it. When Gold refused to pay her, Jem severely injured him, took his money, and left the body to die in the murky heart of Gotham City's Slaughter Swamp. In the moment before sinking under the mud, Cyrus Gold cursed his murderers and swore to God, he would somehow be revenged. Since the event soon became a legend, there have been many other versions of this story, but the main content is the same: Gold was killed and his body sunk into the swamp. Over the next fifty years, Gold's skeleton lay at the swamp's bottom, accumulating decaying leaves, rotting wood, and other debris, and gradually formed into a gigantic creature that somehow imitated a strange form of pseudo-life. In 1944, this creature rose from the swamp, with tremendous strength and some dormant memories that for example allowed him to speak English, but not knowing what he was, and not remembering Cyrus Gold or his fate. Wandering throughout the swamp, he encountered two escaped criminals, killed them, and took their clothes. Shortly thereafter, he met a group of men in a hobo camp. When they asked him his name, he simply muttered that he had been born on Monday. Reminded of an old nursery rhyme about a man born on Monday, the thugs named the creature "Solomon Grundy", and impressed by his great strength, took him on a crime spree throughout Gotham City.